Germany’s decision, under pressure from the USA, to end unrestricted submarine warfare in September 1915 did not end Allied shipping losses to U-boats. In the final three months of the war they sank 140 ships of 361,326 tons. Most of the losses in waters around the British Isles were from mines. The small coastal minelaying U-boats UC1, 3, 5, 6, 7 and 9 , operating from Zeebrugge, laid mines in 16 locations. Seventeen vessels struck mines around Dover and the Nore alone. Mines were laid off Portsmouth in an attempt to disrupt transports to France, one of which sank the destroyer HMS Velox on 25 October. The minelayers did not escape unscathed. UC6 was damaged in early October: the Germans claimed that this was the result of her being rammed by a destroyer but no British destroyer reported such an incident that month. UC9 left port on 20 October and never returned. Her fate is unknown. UC8 ran aground in Dutch waters on 4 November and was interned. Mines were laid in 13 different places in November. Their victims included the hospital ship Anglia, which was sunk on 17 November with the loss of about 80 staff and wounded soldiers. Mines closed Boulogne to shipping on 10, 12-14 and 29 November. Lord Kitchener, the Secretary of State for War, was due to travel home from France on the last of those dates and had to go from Dunkirk instead of the more usual Boulogne to Folkestone route. One raid was carried out by a U-boat in the North Sea in December 1914, with the objective of keeping British escorts that might otherwise have been sent to the Mediterranean in home waters. U24 sank one Belgian and three British steamers during it. A number of U-boats were transferred to the Mediterranean. U21 arrived at the Austro-Hungarian port of Cattaro, now Kotor, on 5 May. As described here, she sank the British battleships HMS Majestic and Triumph off Gallipoli in late May. The coastal boats UB1, 3, 7, 8, 14 and 15 and the coastal minelayers UC12, 13, 14 and 15 were sent partially assembled by rail and completed at Pola. In early August U34 and 35 sailed to the Mediterranean, followed by U33 and 39 at the end of the month and later by U38: these boats were all of the U31 class. U21, UB7 and 8 and UC14 and 15 were based at Istanbul, with the others operating from Austro-Hungarian ports. During 1915 U-boats sank 54 British and 38 Allied and neutral ships in the Mediterranean. As well as merchant ships, they sank a number of troopship, starting with the British Royal Edward, torpedoed by UB14 (Oberleutnant Heino von Heimburg) on 13 August whilst bound from Alexandria to Mudros with the loss of 866 lives. UB14 also ambushed and sank the British submarine E20 in the Sea of Marmara as a result of information obtained when the French submarine Turquoise was captured by the Ottomans. Other warship losses to U-boats in the Mediterranean included the Italian submarine Medusa on 10 June and armoured cruiser Amalfi on 7 July, both sunk by UB15, then captained by von Heimburg. The Italian armoured cruiser Guiseppe Garibaldi was sunk by the Austro-Hungarian U-IV on 18 July and the submarine Nereide by the Austro-Hungarian U-V on 5 August. The Austro-Hungarian navy had begun the war with seven small submarines, named by Roman numerals here to differentiate them from German boats. Their early actions were confined to attacks on French warships. U-IV fired at but missed the armoured cruiser Waldeck-Rousseau on 17 October 1914. On 21 December 1914 U-XII torpedoed and damaged the dreadnought Jean Bart, which was sailing at 9 knots with no destroyer screen despite it being three months since U9 had sunk three British armoured cruisers in a single action. As late as 26 April 1915 the armoured cruiser Leon Gambetta was making only 6.5 knots and had no destroyer screen when she was torpedoed and sunk with the loss of 650 men by U-V, captained by Linenschiffleutnant Georg Ritter von Trapp, whose family were the subject of The Sound of Music. During the war the Austro-Hungarians added only the captured French Curie and a number of German UB boats to their fleet. One reason to switch U-boats to the Mediterranean was to prevent them damaging German relations with the United States of America by killing Americans. On 7 November, however, the German U38 (Kapitänleutnant Max Valentiner), flying Austro-Hungarian colours because Germany and Italy were not yet at war, sank the Italian liner Ancona, killing over 200 people, including about 20 Americans. The US protested to Austria-Hungary, which promised to pay an indemnity and to punish the boat’s captain, who was not named. The Germans, who did not want further incidents with the USA, ordered their U-boat captains to observe prize laws in the Mediterranean, meaning that they had to allow the passengers and crew time to evacuate a merchant ship before sinking her. This was mostly complied with until 1917. Valentiner’s U38, however, sank five British and several Allied merchant steamers between 27 December 1915 and 4 January 1916 with the loss of over 500 lives, 334 of them on the liner Persia, sunk on 30 December 1915. V. E. Tarrant, The U-Boat Offensive, 1914-1945, pp. 152-53. Naval Staff Monograph (Historical) 1926 vol. xv, Home Waters part vi, October 1915 to May 1916. p. 15. Ibid., p. 21. and note 2. R. H. Gibson, M. Prendergast, The German Submarine War, 1914-1918., p. 61. Naval Staff vol. Xv. p. 24. Gibson, Prendergast, German, p. 61. P. G. Halpern, A Naval History of World War I, p. 385. Gibson, Prendergast, German, pp. 78-79. The previous entry in this series described the reasons why the British decided to launch a naval attack on the Dardanelles in February 1915. The attack was to be led by Vice Admiral Sir Sackville Carden, who was then commanding RN forces in the Mediterranean. His force included the RN’s newest dreadnought, HMS Queen Elizabeth, which was the first battleship in the world to be fuelled entirely by oil and the first dreadnought to be armed with 15 inch guns. An accident reduced her speed to 15 knots, so the battlecruiser HMS Inflexible, which was originally intended to return to the Grand Fleet, stayed in order to give Carden a ship fast enough to bring SMS Goeben, the German battlecruiser now in Ottoman service, to action. The other 12 British battleships in Carden’s force were all pre-dreadnoughts; some had been released from overseas stations after the British victory at the Falkland Islands and others were transferred from the Channel Fleet. They included HMS Agamemnon and Lord Nelson, which had been completed after HMS Dreadnought because the 12 inch gun turrets originally intended for them were fitted to Dreadnought in order to expedite her construction. The others were of the older Majestic, Canopus, Formidable, Duncan and Swiftsure classes. Carden also had four French pre-dreadnoughts, giving him a total of 18 capital ships, and the six seaplanes of the carrier HMS Ark Royal. Destroy the forts at the entrance to the straits. Sweep the minefields and reduce the defences up to the Narrows. Destroy the forts defending the Narrows. Sweep the principal minefield at Kephez. Enter the Sea of Marmara. Operate in the Sea of Marmara and patrol the Dardanelles. Each attack on the forts would comprise three stages: a direct or indirect long range bombardment out of either range or bearing of the forts; a medium range bombardment by direct fire, including secondary armaments; and then a final bombardment at a range of 3-4,000 yards. Ships were to withdraw to long range if they came under fire: the largest Ottoman guns were thought to have a maximum range of 12,000 yards. Winston Churchill, the First Lord of the Admiralty, was urged by some staff officers to send the Royal Naval Division, an infantry force under the Admiralty’s control, to Carden. It had been formed at the start of the war from marines, naval reservists who were not needed at sea ships and wartime volunteers, and had fought in Belgium in 1914. At this stage of the war it lacked the supporting forces of an army infantry division. However, Churchill was willing to send only two battalions of Royal Marines to act as landing parties to destroy Ottoman guns. On 16 February it was decided to send the 29th Infantry Division, consisting mostly of regulars recalled from colonial garrisons, from the UK and the two divisions of the Australian and New Zealand Army Corps from Egypt to Lemnos, the naval base of operations. However, Lord Kitchener, the Secretary of State for War, decided three days later that the 29th might be needed in France. 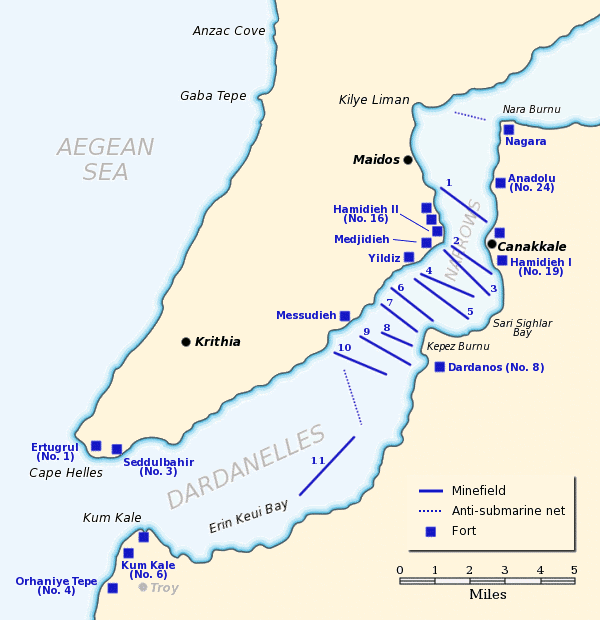 This was the start of the military operation, but at this stage it was still expected that the fleet would force the Dardanelles. The troops were intended to demolish forts, destroy concealed howitzers, take the Gallipoli peninsula once the Ottomans had withdrawn and occupy Istanbul if the expected revolution occurred. The naval attack began on 19 February. It showed that direct hits were required in order to knock out a heavy gun in a modern emplacement; indirect fire was not accurate enough to achieve such hits. The attack resumed on 25 February after a period of bad weather. The forts on either side of the entrance were silenced. Attempts by marine landing parties on 26 February and 1 and 4 March to complete the destruction of the forts were only partly successful because the Ottomans had re-occupied them once the naval fire lifted. Lieutenant Commander Eric Robinson of HMS Triumph was awarded the Victoria Cross for his courage whilst leading one of the landing parties on 26 February. Carden’s first stage of silencing the forts at the entrance to the Dardanelles had now been achieved. There were no minefields in the first half of the 14 miles to the Narrows, but the battleships could not proceed through the minefields in the second seven miles. The trawlers that were employed as minesweepers had a speed of only four to six knots when sweeping, which was halved because they were going against the current. The remaining Ottoman guns were unable to do serious damage to battleships, although some were hit, but their howitzers were deadly against the minesweepers. Carden decided to use the minesweepers at night, but the Ottomans had anticipated this and installed searchlights. The battleships were unable to find the concealed howitzers. Air reconnaissance failed because the seaplanes were vulnerable to ground fire if they flew low and could not see the guns if they stayed high enough to be safe. Carden also employed a slow approach in which he used only a few of his battleships each day. Carden replied two days later that he intended a last attempt at night sweeping that night, which failed. It was now realised that the searchlights made night sweeping impossible. The only remaining option was a daylight operation in which the battleships suppressed the guns in order to allow the minesweepers to operate safely. A plan using all 18 battleships for an attack on 18 March was produced on 15 March. The next day Carden’s health gave way. Command was given to Rear Admiral John de Robeck, his second in command. The RN’s rules of seniority meant that it ought strictly have gone to Rear Admiral Rosslyn Wemyss, commanding the base at Mudros, but he agreed to work under the man on the spot. The fleet was divided into three divisions: the First of the four newest ships; the Second of eight British pre-dreadnoughts; and the Third of the four French battleships and two British ones. Observation would come from the air. Aerial reconnaissance and other sources indicated that the main forts were armed with 42 guns of 8 inches or more, including six 14 inch guns. HMS Queen Elizabeth, Inflexible, Agamemnon and Lord Nelson. HMS Ocean, Irresistible, Albion, Vengeance, Swiftsure, Majestic, Canopus and Cornwallis. Suffren, Bouvet, Gaulois, Charlemagne, HMS Triumph and Prince George. The First was to bombard the main forts from 14,000 yards. The two British ships of the Third would engage the mobile howitzers and field guns. The French ships would attack the principal forts from 8,000 yards, which was the closest that had been swept of mines, once the British ships had dominated them. Six ships of the Second would relieve the French after four hours; the other two would support the minesweepers at night. The fleet entered the Straits at 10:30 am. It came under fire by 11:00 am, but was at the firing position by 11:30 am. Soon after noon enough damage had been done to allow the French ships to move in to begin firing from closer range. Agamemnon, Inflexible, Suffren and Gaulois were all damaged, but by 1:45 pm the Ottoman fire was tailing off. De Robeck called up the minesweepers and ordered the Third Division to relieve the French. Around 2:00 pm the Bouvet suffered two explosions, the second apparently from a magazine blowing up, and sank rapidly. Only 48 men were saved, with about 600 going down with her. The action continued. The forts stopped firing periodically, but this was because the gunners had to clean their guns of dust thrown up by shells landing in front of their emplacements. Between 3:30 and 4:00 pm the battleships began to encounter mines, which they assumed were unmoored, floating ones. About 4:05 pm Inflexible struck a mine. She was badly damaged, and it seemed for a while that she might sink. Around 10 minutes later Irresistible hit a moored mine. Most of her crew were taken off by the destroyer HMS Wear, with ten men staying on board to try and get a wire to Ocean, which was ordered to tow the disabled battleship. However, it was impossible to do so because of Irresistible’s list. Ocean was coming under heavy fire, and was ordered to abandon the attempt at 5:50 pm. The attack was then abandoned, and the fleet ordered to withdraw. At 6:05 pm Ocean struck a mine. Her crew was taken off by destroyers. Destroyers were sent at night to try and tow the two battleships, but both had sunk. As well as the three battleships sunk, Inflexible, Suffren and Gaulois all required dockyard repair. British human losses on 18 March were not high considering the number of ships lost and damaged: naval-history.net lists 13 killed on Irresistible, 35 on Invincible, one on Ocean and one on Majestic, including five men who later died of wounds received that day, but excluding one who died that day of wounds received earlier; including him, 71 British marines and sailors had been killed earlier in the attack. Robert Massie says that 639 men were killed on the Bouvet and 61 in the rest of the fleet. Ottomans and Germans were killed and wounded. The mines that caused the losses had been laid on the night of 8 March by a small Ottoman ship called the Nusret. The minesweepers had swept the central area, finding no mines; they had then assumed that the sides must also be clear. The seaplanes had failed to spot them. It was intended at this stage to resume the attack. The pre-dreadnoughts HMS Queen and Implacable were already on their way and HMS Prince of Wales and London and the French Henri IV were sent to replace the ships lost on 18 March. Bad weather from 19 to 24 March prevented operations. De Robeck originally intended to continue with the naval attack but on the 22 March he told a conference of generals and admirals that the fleet could not get through without the support of the army. The army would not be ready until 14 April. Destroyers were being fitted as minesweepers, but would not be ready until about 2 or 3 April. Churchill asserted that the Ottomans were almost out of ammunition when the attack was called off, a claim repeated by some others, including the early 60s BBC documentary series The Great War. However, Naval Operations, the British Official History, says that the Ottomans had about 70 rounds per heavy gun, 130 per 6 inch gun and 150 for each of those defending the minefields. Forts had been damaged but few guns knocked out. Research by Tim Travers in the Turkish archives shows that the howitzers and other field guns also had plenty of ammunition. The army landed at Cape Helles on 25 April. From then on, the Gallipoli Campaign was primarily a land one, with the navy confined to landing troops, transporting supplies and wounded, providing supporting fire and ultimately evacuating the army. It could not attempt to break through the Dardanelles until the army had taken the high ground, which it never managed to do. J. S. Corbett, H. Newbolt, Naval Operations, 5 vols. (London: HMSO, 1938). vol. ii, pp. 140-44. A. J. Marder, From the Dreadnought to Scapa Flow; the Royal Navy in the Fisher Era, 1904-1919, 5 vols. (London: Oxford University Press, 1961-70). vol. ii, p. 232. T. Travers, Gallipoli, 1915 (Stroud: Tempus, 2001). Marder, From. vol. ii,. p. 233. Corbett, Newbolt, Naval. vol. ii, p. 149. Marder, From. vol. ii, p. 234. R. K. Massie, Castles of Steel: Britain, Germany, and the Winning of the Great War at Sea (London: Jonathan Cape, 2004), pp. 449-51. Corbett, Newbolt, Naval. vol. ii, pp. 213-28. Marder, From. vol. ii, p. 247. Corbett, Newbolt, Naval. vol. ii, p. 227. Corbett, Newbolt, Naval. vol. ii, pp. 223-24; Travers, Gallipoli, pp. 36-37. Corbett, Newbolt, Naval. vol. ii, p. 224. Marder, From. vol. ii, p. 258.